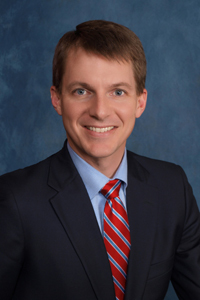 Daniel R. Hughes, a native of Pickens, SC, began his legal career in 2004 and began private practice in August 2006. Daniel began his legal career in 2004 as a judicial law clerk for the Honorable G. Edward Welmaker of the Thirteenth Judicial Circuit. After his two-year clerkship, Daniel began private practice in August 2006. Daniel’s practice is well rounded and diversified. His practice includes civil litigation, personal injury, social security disability, probate administration, litigation (including Guardianships and Conservatorships), real estate, corporate law, and estate planning. He also serves alongside John Duggan as counsel for Greer and Mauldin. Daniel is the prosecutor for Greer, Mauldin, and Travelers Rest. Daniel also serves as general counsel for the Greater Greer Chamber of Commerce. In 2014, Daniel received the “Sud” Pagett Volunteer of the Year award from the Greer Chamber. When not at work, Daniel is with his wife and children, runs, follows college sports, outdoors, and volunteering in the community. While at Furman, he ran cross-country and track and served as the team captain in both sports his senior year. Daniel competes in races and narrowly missed qualifying for the 2008 Olympic Trials in the marathon. Admitted: South Carolina (2005); United States District Court, District of South Carolina (2009); Fourth Circuit Court of Appeals (2014). Municipal Law Experience: City of Mauldin (Prosecutor and General Counsel, 2006 – present); City of Greer (Prosecutor and General Counsel, 2006 – present); Town of Lyman (Prosecutor and General Counsel, 2006 – present); City of Travelers Rest (Prosecutor, 2006 – 2012).